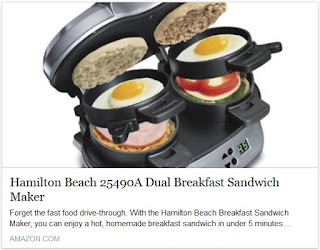 What do you think of this breakfast sandwich maker? Great idea or waste of money? Simply place the ingredients inside, build the base of your sandwich in the bottom layer, place the egg on the cooking plate and close the lid. Slide the cooking plate out and your sandwich assembles itself. Open the lid and your hot breakfast sandwich is ready to eat. The included recipe book provides a variety of breakfast sandwich options, from the traditional egg, ham and cheese to the unique cheddar, apple, bacon and egg croissant sandwich.